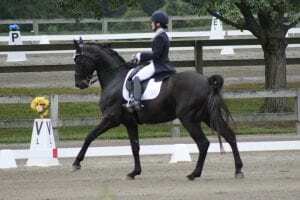 Every year the Fredericksburg Chapter (VADAF) of the Virginia Dressage Association (VADA) takes on the enormous task of hosting a USEF/USDF licensed dressage show. This event takes place in early September and is one of the last shows where competitors can earn final qualifying scores for GAIG’s or BLM’s. What are GAIG’s or BLM’s? In layman’s terms, the BLM’s are East Coast championship events that require qualifying scores to be eligible to enter. These scores tend to be a lower requirement than the GAIG’s. The GAIG’s are the Region One championships (NC, VA, MD, WV) that require higher qualifying scores and are also the gateway to being invited to the National USDF Championships. VADAF runs the show separately; one show on Saturday, and the second show on Sunday. This benefits the competitors, as they are able to gain the needed scores for qualifying from two separate judges and from two separate shows. Not many clubs tend to run events in this manner. Now, with that explanation out of the way….what does it take to put on a show of this caliber? VADAF is a small non-profit that is formed of around 50 paying members. The club is a close-knit family, and we take quite a bit of pride in the horse show we host every September at Rosemount Farm. This year it was quite a struggle, but we all banded together and managed to pull it off with great success! 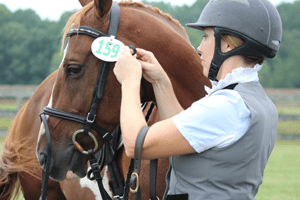 Many equestrians have full-time jobs – especially those of us who are not full-time trainers or ride as adult amateurs – and the dedication it takes to organize a show like this is immense. Challenges including finding a new show secretary (all hail Bettina Longaker), securing sponsors and donors, finding a 3rd judge at the last minute because of the overwhelming number of entries (Nancy Lowey to the rescue), specifics of the show program, etc., all fall on the shoulders of many volunteers and a show committee. Feelings get hurt and egos get bruised in the process, but in the end, we are all always proud of what we are able to accomplish. This year, so many of our members stepped up to the plate to make this show the best one ever, despite the torrential rains that were brought in by Tropical Storm Gordon. During the week leading up to the show, our event committee and volunteers stuffed goody bags for the competitors, welcome bags for the judges, set up rings, delivered bedding to the stalls, printed programs, and decorated the show grounds for a warm welcome to the competitors and guests. All of this was accomplished in severe heat and humidity and we are so thankful for everyone’s hard work. Horse trailers started rolling in on Friday before the start of the event, and everyone’s fingers were crossed hoping that the weatherman’s predictions were once again erroneous. 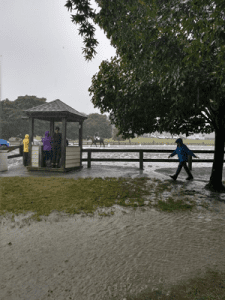 On Saturday, only a handful of riders had to deal with the wrath of the tropical storm – there were bursts of downpours between misty conditions, and yours truly got soaked during a ride! However, the day went off without any major hitches. 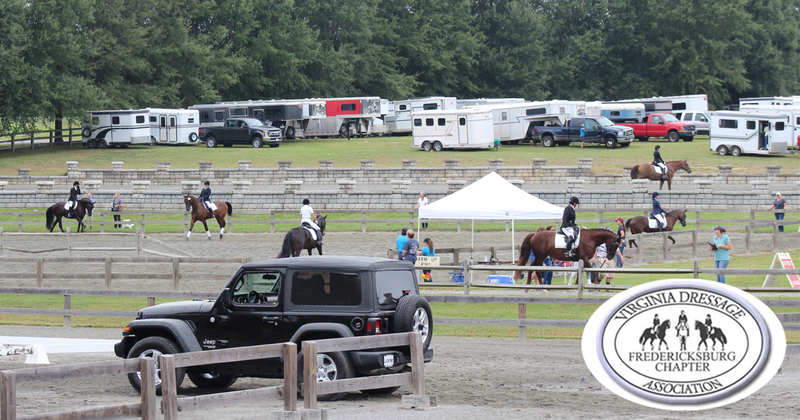 Competitors were happy, 3 rings were running on time (this was a first in VADAF history – we typically only have 2), no trailers got stuck in the mud, and quite a few of our riders received scores for their USDF medals! And then came Sunday… It turned out that the weatherman was oddly correct. It rained for nearly the entire day and created less than stellar riding conditions. 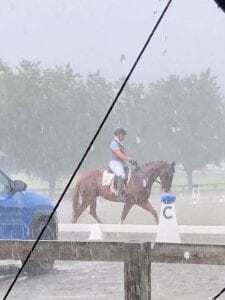 There were plenty of scratches, but show management was able to shift rings around because of sloppy footing conditions and keep everyone that wanted to ride happy and safe. Once again, our volunteers stepped up to the plate to take down and pack everything away in the wet and miserable weather at the conclusion of Sunday’s event. Next time you are at a horse show, please remember that the events are produced by volunteers and please thank them! If it were not for the volunteers, our club members, and our very important sponsors, horse shows wouldn’t exist. In the future, if you are approached by a member of a horse show management team to donate money for a class, place an ad, or volunteer… please participate! A lot goes a long way to keep our sport afloat – even without the wrath of a tropical storm. 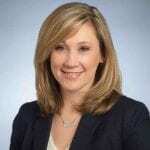 Lorraine Klepacz is the Business Developer and a blogger for Top Line Media Team. She is a USDF Bronze Medal recipient, USDF L Graduate, and OHSA judge who has studied under Jimmy Wofford, Mike Mendel, Stephen Bradley, Peter Foley, Joe Fargis, Bianca Birktold, Kathy Whitehouse, Pati Pierucci and many other professionals and Olympic equestrians. Early in her riding career she was on the hunter jumper circuits, loved the jumper ring, but most notably excelled in Eventing up to the Intermediate level. Most recently you can find her in the dressage ring or out foxhunting. In addition to her work with TLMT, Lorraine is a trainer who teaches practical and safe horsemanship to her clients and their horses.